Christ Church is the mother church of the Parish of Warrnambool, Victoria. Situated in Henna Street and heritage listed, Christ Church was constructed in stages over a number of years, beginning in 1856, with its latest extension being opened in 2011. Within the same walled heritage-listed precinct, are also the Rectory, a lych gate, a large parish hall, meeting rooms and Sunday School, and old horse stables. The numerous memorials and extensive records of the parish, document and honour many of the people prominent in the parish and also in the development of Warrnambool and district. The church is noted for its bell tower with three German bells, and its beautiful pictorial stained glass windows. I visited your beautiful church on 14 June 2013. I loved the double nave, high Gothic feeling, the beautiful stain glass windows, and the plaques telling so much history. There is a warm and spiritual feeling about this well-cared for church. And I loved the recent addition of offices and parish gathering space.Thank you for having it open on a very cold wet day! We have lost a black mobile phone, did anyone find it at the church today? I enjoyed the 'cartoons'. Like to think this church is most of all known for her Gospel Preaching. Without the preaching of Christ, no-one will be saved and go to Heaven. Stained glass, fourth from left in group of five lancet windows, west wall, north nave. To the Glory of God/and in loving and grateful memory of/ THOMAS FALKNER FLEETWOOD, M.D./a learned Scholar: a wise and skilful Doctor: above all, a/ faithful Servant of Jesus Christ, for Whom he worked, with Whom he suffered, in Whom he lives./ Thine Eyes shall see the King in his Beauty./ This window was given by/ parishioners and other friends. 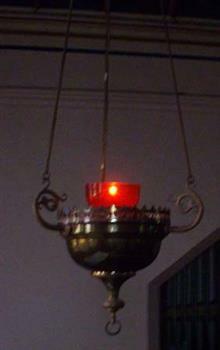 Brass sanctuary lamp with inner red glass light holder. Connected to electricity. The lamp hangs from a pulley system by three brass chains. These are connected to three ornate 'wings' attached to the bowl. This sanctuary lamp was presented to by the Reverend Albert Thomas Hope in memory of his wife. Memorial Window: Elizabeth Edith MACK - "Christ Ascending in Glory"
Circular stained glass window above five lancet windows in the west wall of the second nave, depicts 'Christ Ascending in Glory'. The inscription is on a mosaic plaque below the central window. Elizabeth Edith Mack was born to parents William & Elizabeth (nee Wilmont) Hatton, in approx. 1873 in Moyston, Victoria. She married Frederick David Mack (a wool and skin buyer) in approx. 1903. Frederick Mack was born in 1968 in Warrnambool to parents Joseph and Louisa Mary (nee Despard) Mack. Joseph served as Shire Secretary. The Mack family (including Elizabeth and Frederick) occupied the same sandstone house in the town for more than a century. They had at least 5 children. Elizabeth Edith Mack died in Warrnambool in 1931 aged 58 years. The Circular Memorial Window was erected in her memory by her children. Elizabeth and Frederick's son, Ronald, became The Honorable Sir Ronald (William) Mack, M.L.C. President of the Legislative Council of Victoria. He was knighted in 1967 (the first Warrnambool -Born person to be so honoured) while Minister for Health and regarded the care of the Mentally Ill of prime importance but also the care of the aged. He was given a state funeral after his death in 1968, the service being conducted at Christ Church. The Mack family was a prominent pioneer family in Warrnambool. Her son Ronald William Mack was the first Warrnambool-born person to be knighted. The mosaic tablet below the centrral light refers to this memorial to Elizabeth Mack. "The Above Circular Window/ is erected/ To the Glory of God, in Memory of/ our beloved Mother/ Elizabeth Edith Mack/who departed this life on 23rd December 1931." Memorial window: Helen Isobel Janet MACK - "Peace... Goodwill Towards Men"
Helen Isobel Janet Mack was born to parents Gilbert Bailee Nicol and Lizzie (or Lillie) Mary Nicol (nee Jellie) at Woodford, Victoria or Rose Hill Warrong, in approx. 1895. Her mother's parents were James and Sarah Jane Jellie (nee Bower) Her father's parents were Gilbert and Jane Boili Nicol (nee Jelllie) She lived her life here at least until her first marriage. She firstly married a Mr LIndsay and they had two daughters - Helen and Jane. They were later divorced. On 16th February 1935, Helen married Ronald William Mack (a pioneering family of Warrnambool) at the Registry Office in Collins St. Melbourne. They had a son James. It appears Helen lived at 52 Banyan St, including while her husband was absent, until her death. Her husband Ronald William Mack was born in Warrnambool in 1904. He joined the Australian Imperial Forces and was based in the Middle East during some of WW11 and returned to Warrnambool in approx 1943 due to injury. He was involved in the community, and politics and was elected to the Legislative Council in 1955. Janet died on 10th April, 1957, aged 55 years, her funeral leaving Christ Church on April 11th. Her husband had erected in Christ Church, a Memorial Stained Glass window in her memory. Her husband was eventually Knighted (in 1967) while he was Minister for Health of which his main focus was on the mentally ill and the aged. He was then Sir Ronald William Mack. First wife of Sir Ronald William Mack. "Peace... Goodwill Towards Men"/ To the Glory of God/ and in memory of Helen Isobel Janet Mack,/ who died on 10th April 1957./ The gift of her husband. Four stained glass windows, three lancet and one circular. The theme of the lancet windows depicts the three occasions when the apostles Peter, James and John were Jesus' sole attendants: The raising of Jairus' daughter. On the Mount of Transfiguration. In the Garden of Gethsemane. 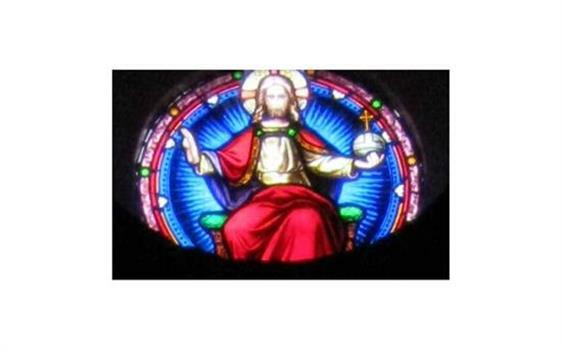 The circular window in the gable of the wall represents "The Enthroned Christ". William Bateman Snr was born to parents Daniel Bateman and Patience Wilkinson in Bradford, Yorkshire, England in approx. 1794. He married Sarah Smith on 20th November 1815 in Bradford, Yorkshire, England. They had four children – Patience (Born abt 1817), Daniel (born abt 1819) William (born abt 1831) & James (born abt 1837)all born in England. William Snr and Sarah Bateman and two sons – William and James - arrived in Australia in approx 1853. They brought with them considerable capital/stock and bought into a business in Warrnambool in William Jnr’s name. Bateman & Co rapidly became the largst mercantile business in the area and did rather extensive business with the Banks of Victoria and Australiasia. It is thought that William Snr assisted in the business to some extent, expecially financially. His other son Daniel (who remained in England) is also thought to have had a financial interest in the business as a dormant partner. The business was so prominent, Bateman & Co issued round copper tokens as a Trade Token - value one penny. These were inscribed with the Business name and were limited in their use to the business. In Sept 1856 the business was transferred to a Mr. Thos W. Sellars (nephew of William Bateman Jnr) and shortly afterwards the store closed with an order for the sequestration of the insolvents estate, but was not made absolute until December 1856 when the Insolvency court ruled for the “compulsory sequestration” of the business due to fraudulent activities within the business. But in the meantime in early November fire completely destroyed the business which left only the insurance payouts. Both William Bateman Snr and William Bateman Jnr are listed on the Pioneers’ Honour Board in the foyer of the Warrnambool Library. It is reported William Bateman Jnr was a trustee of Christ Church, was a City Councillor, and was involved in many other community organisations. He also subscribed towards the cost of building a permanent Church which was opened in 1856. William Bateman Snr died in Warrnambool on 30/03/1868 and his wife Sarah died in August 1868. William Bateman Jnr presented to Christ Church, stained glass windows in memory of his parents William & Sarah Bateman. William Bateman Jnr died in June 1913. Mosaic set into blind window alcove, south wall, sanctuary, main nave. Plain white cross outlined with gold and set against a blue opus sectile mosaic on a biscuit coloured tile background bordered with stylised vine leaves and grapes. Florence Amanda Lake (1870-1946) was the daughter of John and Jane LAKE. Following her husband’s death, Jane married George ROLFE of ‘Lyndoch', Warrnambool. After his death Florence remained at 'Lyndoch' until moving to Melbourne in later life. Florence was noted for her charity and philanthropy. This memorial was presented by Mr George Webb of Camperdown. Florence Lake is buried in the St Kilda General Cemetery. Florence Lake was very loyal and generous parishioner of Christ Church and the Parish of Warrnambool and in the city generally. The association with George Rolfe and 'Lyndoch' is historically important. Memorial window: Elizae (Eliza) RUTLEDGE - "By Thy Glorious Ascension Good Lord Deliver Us"
Stained glass, lancet window, south wall, main nave. Depiction of the ascension of Christ. Eliza Rutledge (1820-1888) was the daughter of Rupert and Jane (nee Newby) Kirk. She married William Rutledge in St James’ Church, Sydney on 18th August, 1840. She and William had five children, two sons and five daughters. Recorded accounts tell that Eliza was “beloved for her kindness and hospitality” and that she and William kept open house for all manner of social events and occasions. Eliza died at Farnham Park, Dennington, on 31st August 1888. She is buried at Tower Hill Cemetery. The marriage of Eliza to William Rutledge, a man of historical importance in the development of Port Fairy, Warrnambool and the western district of Victoria, places her as a person of importance.Their daughter Susan Fleetwood is also memorialised in a window in Christ Church, Warrnambool. Their son Thomas Forster is also memorialised with a tablet positioned near the Eliza Rutledge windows. "By Thy Glorious Ascension Good Lord Deliver Us" In Latin: +In Memoriam+ Elizae Rutledge quae pridie idus Februarias/ MDCCXX nata pridie kalendas Septembres MDCCCXXXVIII obit/ liberi amantissimi Gulielmus Rutledge et Susanna Fleetwood pietatis/ indicio hane Jenestram posuerant Beati qui sunt mundi corde. Stained glass lancet window, north wall, north nave, depicting Saint Michael, the arch-angel Michael. Samuel McGeorge was born in Belfast, Ireland in 1850. He was trained for the ministry at Moore College, Sydney. He was Vicar in Ararat for 10 years prior to coming to Warrnambool in 1899, to become the 3rd Vicar of the Parish. He was inducted on June 1st by Bishop Cooper. He showed a deep regard for the welfare and happiness of his parishioners. Christ Church progressed well under his charge. He suffered a very painful and distressing illness which forced him to obtain leave of absence from his clerical duties, but he continued to visit and encourage the sick and sorrowing. On December 4th 1904, Canon McGeorge opened the new Church and Sunday School in Koroit St, East Warrnambool, of which he had established. It was opened as a Mission Hall. It was to become St. George's and the first recorded service was on February 11th 1906. He preached his last sermon at Christ Church on Dec 4th before illness prevented him performing his duties. He resigned from the Vicariate shortly before his death in Warrnambool on December 16th, 1905. The stained glass window in the north wall of the second nave was a gift of many parishioners. Depicting St. Michael, it was erected in memory of Rev Canon McGeorge, and was unveiled by Dean Parkyn on December 23rd, 1906. His widow Mrs Emma McGeorge, remained an active church worker until her death in 1933. The Lych gate at the Koroit Street entrance was built with a bequest from her. Memorial window: Rev Andrew PEACOCK - "I will make you fishers of men"
Stained glass window, south wall, main nave (adjacent to the pulpit). The window is a pictorial representation of St Andrew who live to old age. There is a tradition that on being sentenced to death, he requested that he be crucified on a saltire (diagonal cross, see base of window) as he felt unworthy to be crucified on the vertical cross of Christ. Another symbol of association with St Andrew is the fishing net. The Rev. Andrew Peacock, Archdeacon of the Otways, was the fourth Vicar (1906-1912) of the Parish of Warrnambool. He was highly regarded throughout the community and died following a very short illness. 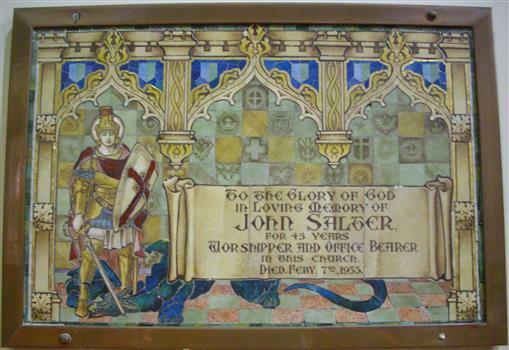 His brother, Sir Alexander Peacock, three times premier of Victoria, officially unveiled a tablet on the north-west corner of the Parish Hall complex on Saturday 25th April and attended the dedication of the memorial window on Sunday 26th April 1913. Rev AE Peacock is buried at Creswick cemetery, Victoria. In Latin: In memoriam Gulielmi Afflick qui AD MDCCCLXVII Kal: Jun: in vitam ingressus Septimo ante Io Apr:/ AD MDCCCLXXV iridiebahir mater ejus et sorer Maria et Jacobus Wotton Shevill hanc fenestram posuerunt A translation is: "His mother and stepfather, Mary and James Wotton Shevill, erected this window in memory of William Affleck, who entered into this life on June 1st, 1867, and was taken away on April 7th, 1875". Memorial window: William RUTLEDGE - "BY THY CROSS AND PASSION GOOD LORD DELIVER US""
Stained glass window, south wall, main nave, depicting Jesus bearing the Cross. The background is quite floral. A medallion shape holds the title as printed on a ribbon: "By thy cross and passion good Lord deliver us". William Rutledge [born 1806, Ireland] was a self-made, larger-than-life man who involved himself prominently in business, municipal, political, community and social aspects of life. Eldest son of James and Martha [nee Forster], William arrived in Australia from Ireland in 1829 and within six years had sufficiently established himself to purchase land in New South Wales. He married Eliza Kirk in Sydney in august 1840. They had two sons and five daughters. In 1843 he began his association and life in Port Fairy and soon became prominent and influential in almost all aspects of that developing town. His interests encompassed mercantile, civic, pastoral, shipping, importing, exporting, immigration, politics and social aspects with in the district and colony. He was a major contributor to the building of St John’s Anglican Church, Port Fairy. He acquired three special surveys with historical importance in Victoria. In south west Victoria that interest being especially the Farnham Survey of 5120 acres between Dennington and Tower Hill/Killarney. This was farmed by immigrant tenant and lessee farmers, some of whom were brought to the Australia at William Rutledge’s own expense and by whom he was considered a kind and considerate landlord. His endeavours were not without failures and in 1862 his Port Fairy Company failed with debts of over £170,000. This debt was redeemed in full within a year. According to reported accounts, William Rutledge had a tempestuous manner with an “explosive” temper, although he did not hold grudges. This is countered by accounts of his kindness, generosity, honesty and practical, progressive outlook in all his undertakings. After the failure and closure of his Company, William Rutledge moved to his property at Farnham Park near Warrnambool where he concentrated his interest in breeding sheep and horses. Throughout his life his home was reputed to be convivial and hospitable. William Rutledge died at Farnham Park on June 1st, 1876. William Rutledge's place in the history of settlement in south west Victoria gives importance to this memorial. Memorial Window: Susan FLEETWOOD - "Saint Mary"
Stained glass lancet window, west wall, north nave, second light from the left in the group of five lights, Depicting the Blessed Virgin Mary facing towards the central light of the Crucifixion, the predominant colours are blues and purple/magenta. Towards the top of the design is an angel holding the Alpha symbol. At the peak of the design is a golden crown. The inscription tells of the person, Susan Fleetwood. That Susan Fleetwood was the daughter of William Rutledge, and the wife of Thomas Falkner Fleetwood places her with two men of historical importance in Warrnambool and district. To the Glory of God, and in loving memory of/ Susan, daughter of William and Eliza Rutledge/ of Farnham Park Dennington, and wife of/Thomas Falkner Fleetwood/ born at Port Fairy, July 9th 1848, Entered into rest April 18th 1932./ By her devoted affection to her family and friends, and/ her generous help to all who were in need and distress/ she won the love and gratitude of many./ "Then are they glad because they are at rest, and so/ He bringeth them into the haven where they would be. "/ This window is erected by her Son and Daughter. 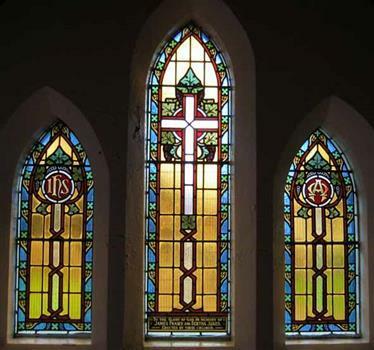 Three lancet stained glass windows. The window on the left has the symbol IHS, an abbreviation of the Greek word for Jesus. 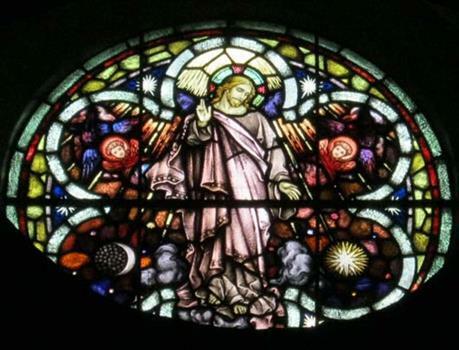 The central window has an empty cross, the right window has the Alpha and Omega symbolising 'the beginning and the end/the first and last'. To the Glory of God. In memory of / James Fraser and Bertha Jukes./ Erected by their children. Memorial Window: John Edward BENNETT - Crucifixion "I, if I be lifted up from the earth/ will draw all men unto me"
Stained glass memorial lancet window, central light, west wall, north nave, depicting the crucifixion of Jesus. John Edward Bennett was born in Leeds, Yorkshire, 1862. He was devoted to his family and his church, being a churchwarden and a verstryman of this Parish. He was a lay preacher for 40 years in the Dioceses of Melbourne and Ballarat. He was the first Manager of the Warrnambool Woollen Mill. He died on Nov 10th 1928. He was the first manager of Warrnambool Woollen Mill. To the Glory of God and in loving memory of/John Edward Bennett/ sometime Churchwarden and Vestryman of this Parish, and for/40 years a Lay Reader in the Dioceses of Melbourne and/ Ballarat, born in Leeds, Yorkshire, 1862, entered into rest Nov 10th, 1928/ A devoted husband and father,/ a faithful servant of God and His Church/Not slothful in business, fervent in spirit, serving the Lord. 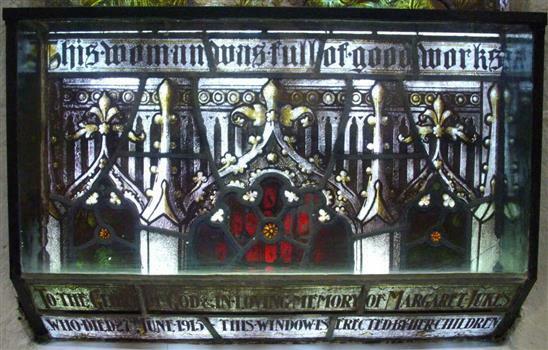 Memorial window: Margaret JUKES - "Dorcas"
Stained glass widow depicting Dorcas, symbolical of Benevolence. Margaret Jukes (nee McWilliams) married Alfred Meredith Jukes in Melbourne in 1853 and they moved to Warrnambool in 1856. She and Alfred had nine children one of whom died in infancy and four who died in young adulthood. Margaret was widowed in 1872, the year of the birth of their youngest child. A report of her funeral service in the Parish Record notes her "aged and much honored life". The hymns chosen "all were in quiet harmony with the remembrance of one whose daily life was an example and who held always a given trust in the over-ruling providence of God". It records the "peaceful closing of a well spent life". The Jukes name is associated with Jukes Street in East Warrnambool, and with the property named "Belvedere" in Ferguson Street, East Warrnambool. Alfred Meredith Jukes is one of the 204 men whose photo appears on the large framed assemblage of "Pioneers of Warrnambool"
This Font Ewer in Christ Church is historially significant. As a memorial to Constance Louise Redmond it connects us to her husband Johnston Redmond, Vicar of the Parish 1919-1922. There is no memorial for him in the church. This ewer's practical function is as a water carrier for the Baptismal Font. It has been in continual use since it was presented in 1927. Memorial tablet, south wall, main nave. Decorative opus sectile mosaic within a copper frame, depicting St George slaying the dragon. The inscription is positioned on a stylised ribbon as part of the design. Memorial window: Herbert Firks SAMBELL - "I Am The Light Of The World"
Stained glass, lancet window, north wall, north nave, depiction of Holman Hunt's painting (1851-1853) "The Light of the World"
Herbert Firks Sambell was the son of John Sambell, a chemist,who settled in Warrnambool in 1886. "To the Glory of God/ and in Memory of Herbert Firks Sambell/ died 16th June 1943./The gift of his loving family. 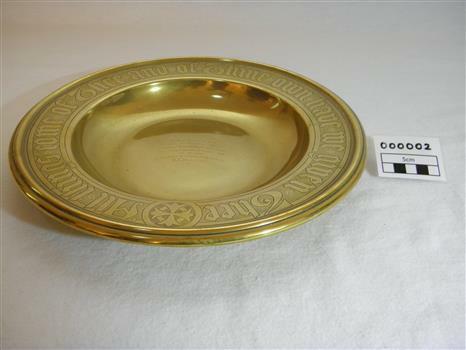 Brass Collection Plate presented to St Paul's Anglican Church, Allansford, by the mother of Joseph & Frank Dallimore as a Memorial to the two brothers who drowned at Ryan's Den (near Cape Otway) on Jan 1st 1903. Major Joseph Dallimore (aged 32) was on leave from Sth Africa during the war and he, his wife (Beatrice Wiggs) and baby, his brother Frank Rupert Dallimore (aged 22), a farm hand Arthur Geach (aged 19) and a house maid servant, were picnicing at Ryan's Den (near Cape Otway) when the three men went walking, but never returned, all assumed drowned. One theary has it - Mrs M.E. Dallimore was picnicing at Lake Gillear beach when an enormous wave swept over the shore - (much larger than any other during that day) and rolled in all along the beach. This wave may have also reached the area where the three men were walking on the rocks and swept them into the ocean. Only one body was recovered - some 4 weeks later - that of Frank Rupert Dallimore and washed into Brown's Creek, 1 mile from the Johanna River and ten miles east of Ryans Den. It is a memorial plate and records the family's attachment and importance to the Church. Embossed wording around edge of plate in Old English font reads - "All things come of Thee and of Thine own have we given Thee". The inscription on the tondo of the plate reads - "TO THE GLORY OF GOD / AND IN MEMORY OF / JOSEPH & FRANK RUPERT DALLIMORE, / WHO WERE DROWNED AT RYAN'S DEN, / JAN 1ST 1903. / PRESENTED BY THEIR LOVING MOTHER, / M.E.DALLIMORE." 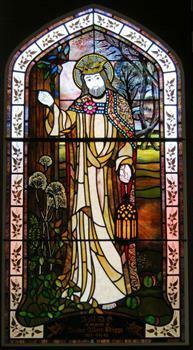 Memorial window: A.A. BRIGGS - "I Am The Light Of The World"
Stained glass, lancet window, east wall, Meeting Room, Hammond Fellowship Centre. A depiction of Holman Hunt's painting "I am the Light of the World"
The bells were sent to the Melbourne Exhibition of 1881. They were awarded first prize. Guaranteed to chime to the sixteenth of a tone. They were purchased by Frederick Perkins Stevens and given to Christ Church Warrnambool as a gift in memory of his son, Frederick Stephen Stevens, who died at his Queensland property in1879. 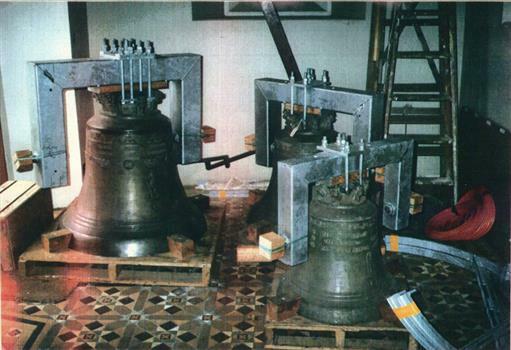 These German bells are the oldest matched peal in Australia. 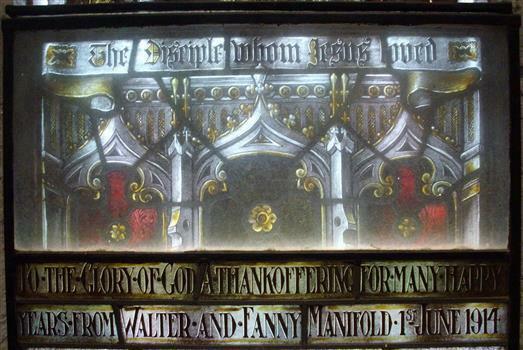 Thanksgiving window: Walter & Fanny MANIFOLD - "St John"
Stained glass, lancet window, north wall, north nave. Depiction of St John with the symbols of a quill, ascribing to him the Gospel of John, and an eagle representing the soaring loftiness of of his writings. Stained glass, lancet window, north wall, chancel, main nave, memorial window. Depiction of the boy Jesus with his mother in the carpenter's workshop. Three lancet stained-glass windows, east wall, main nave, above the High Altar. Presented by Frederick Perkins STEVENS in memory of his wife Jane (nee RULE), born abt 1821, died 1868. The windows from left to right depict the Baptism, Crucifixion and Ascension of Jesus. Transversing the lower section is a depiction of the Last Supper. Running across the bottom of the windows is the inscription. Frederick Perkin Stevens was a prominent in business and community matters. He also presented the peal of three German bells in 1881 as a memorial to his and Jane’s son.. 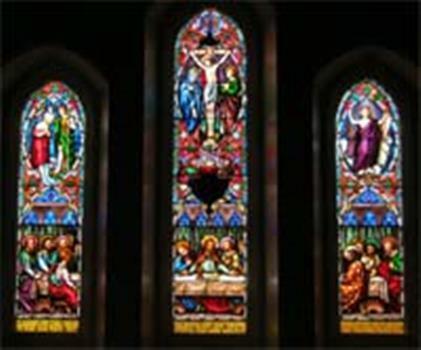 These windows are among the earliest stained glass windows in Christ Church and because of their position make a strong visual impact in the church. Further, Frederick later married Emma Bews, sister-in-law of the Reverend Peter Tuelen Beamish, first Vicar of the Parish of Warrnambool (for a period of 45 years 1850-1895,), thus consolidating his association with the church. Left window: IN MEMORIAM JANÆ VXORIS CARISSIMA REDEMPTORI SVO IN GREMIVM COMMISIT SE ILLAM INTER BEATOS CITIVS Centre: OVAM DISIDERIO SVMMO ANNOS XLVIII NATUM FREDERICUS STEVENS CONJVX VIDVVS QVI REVISVRVM SPAM LÆTAM AMPLECTITVR Right: SEPTIMO ANTE KAL SEXT A.D. MDCCCLXVIII PAVLISPER INTER VIVOS MORATVS HANC FANESTRAM POSVIT This may be translated as: "This window was erected in memory of Jane, his beloved wife, whom at the age of 40 years on the 26th day of July, 1868, with deepest grief and love he committed to the bosom of her Redeemer, by her bereaved husband, Francis Stevens, who tarrying a little while among the living, embraces the hope of meeting her speedily, if it may be, among the blessed." 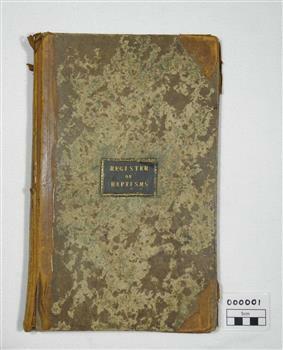 This Register is the first Baptismal Register for the Anglican Church in Warrnambool and District. The Vicar at the time, Peter Tuelin Beamish, oversaw the development of the first Church and the subsequent building of Christ Church. Four stained glass windows, west wall, main nave. 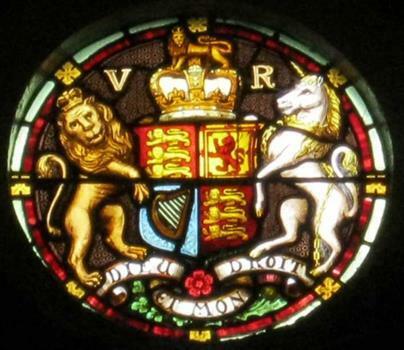 A circular window in the gable of the wall showing the Royal Coat of Arms. Three lancet windows below depicting, from left to right, Faith, Hope and Charity. An opus sectile mosaic in shades of green, surrounding plain coloured tiles with the inscription, set in a grey marble surrounding frame. 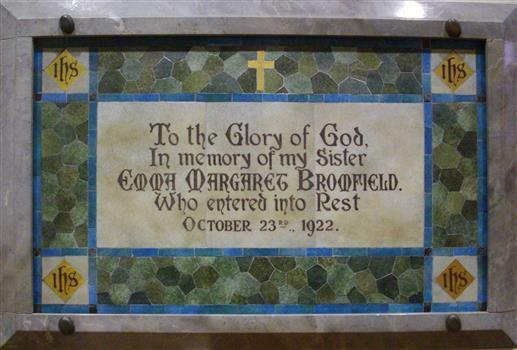 To the Glory of God / In memory of my Sister / Emma Margaret Bromfield / Who entered into Rest / Oct 23rd 1922. Stained-glass lancet window, south wall, main nave. A depiction of the risen Jesus. Eliza Rutledge (1820-1888) was the daughter of Rupert and Jane (nee Newby) Kirk. She married William Rutledge in St James’ Church, Sydney on 18th August, 1840. She and William had five children two sons and five daughters. Recorded accounts tell that Eliza was “beloved for her kindness and hospitality” and that she and William kept open house for all manner of social events and occasions. Eliza died at Farnham Park, Dennington, on 31st August 1888. The marriage of Eliza to William Rutledge, a man of historical importance in the development of Port Fairy, Warrnambool and the western district of Victoria, places her as a person of importance.Her daughter Susan Fleetwood is also memorialised in a window in Christ Church, Warrnambool.Her son, Thomas Forster is memorialised in a tablet near the two windows for Eliza. In fond memory of ELIZA RUTLEDGE who was born on / 12th February AD 1820, who died on 31st August AD 1888, this / window is erected as a token of filial affection by her / loving children Thomas F Rutledge, Martha Hamilton and Edith McKellar. Stained glass lancet window memorial to the Reverend Walter Guthrie Bower, the 7th Vicar of the Parish of Warrambool 1923 - 1932. Depicting Jesus as the Good Shepherd. Rev Walter Guthrie Bower was born in Lincoln, Lincolnshire, England in 1877. He was a graduate of London University and was ordained a priest in 1901. He had been a curate of St. Michael & All Angels, Bedminster, then he became the Vicar of St. Thomas, Bristol, for 8 years prior to coming to Warrnambool in 1923. He made a lasting impression on the Parish with his teaching and Christian humility and service. He was a quiet, scholarly, Christian gentleman who endeared himself to all sections of the community. He was married to Norah Marianne. He resigned from the Vicariate of Warrnambool in 1932, to return to England to accept the living of Metfield with Withersdale, Suffolk. HIs address when he died was - The Vicarage, Metfield, Harleston, Norfolk. He died on Mar 26th, 1936 aged 59 yrs leaving his widow Norah. Norah died in 1963 aged approx 77 yrs in Horiston, Devon. To the Glory of God. In grateful and/affectionate memory of the life and ministry of/ Walter Guthrie Bower/ Vicar of this parish 19230-01932. A faithful minister of the Gospel. Stained glass lancet window, east wall, bell tower, depicting the visitation of the three magi/wise men with their gifts of gold, frankincense and myhrr for the Christ child. The Worland family has played a significant role in the life of the parish for many generations. James (church warden) and Elizabeth Worland had 10 children and at least 3 sons went on to become very involved in the church, holding some form of office. Henri became Town Clerk of Warrnambool, others involved in their own business in Warrnambool. Ernest Thomas Worland the 4th child, born at Portland on Sept 30th 1877, but lived most of his life in Warrnambool. He became a church warden in 1926 and remained so for approx. 40 years and vicar's warden for approx 15 years. Ernest married Margaret White in May 1902 and they had 6 children. Ernest worked in his father's tannery and took over the business on his father's death in 1918. His trade was listed as a 'currier'. He later turned to dairying when the business was destroyed by fire. Ernest and his wife lived on the corner of Henna and Lave Sts for over 40 years. His main interest was in Christ Church. Ernest died on 27th December 1963 aged 86 years and is buried in the Warrnambool Cemetery. His wife Margaret died on 2nd December 1967 aged 92 years. On his death the Vicar of Christ Church, Rev Gordon Brown, said "Mr. Worland had an outstanding record of service with Christ Church, Warrnambool. He was utterly devoted to his church and served with distinction as vestryman, church warden, vicar's warden and synod representative." This stained glass window was presented by the family some time after their mother passed away (in 1967) in memory of both parents. To the Glory of God/in memory of/Ernest Thomas Worland/ Church warden - 1926 - 1963. Died 1963./and his wife Margaret. Died 1967/Given by their family.